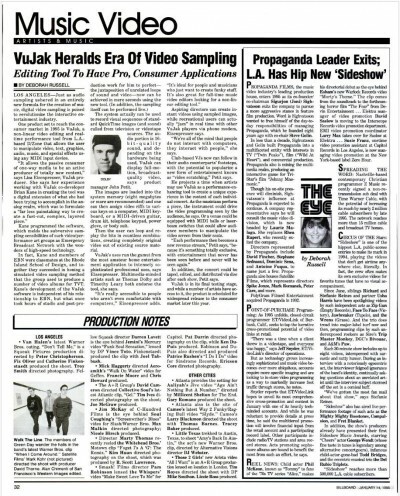 Was just sent this Google Books scan of a Billboard Magazine article on Vujak from 1995, or 3 BG (Before Google). What will they scan next? Special thanks to Sandro Canavezzi de Abreu and everyone at UFSCar for making the 1º Contato festival a great success. I had a fantastic time, and was inspired by the creative efforts of everyone involved. 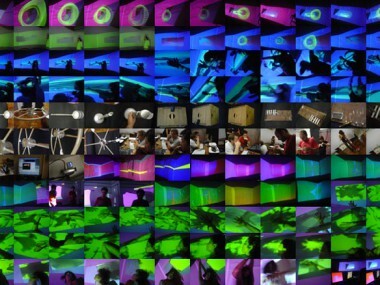 For the festival, we put together a weeklong experimental workshop which focused on exploring interactive connections between disparate media. We used Max/MSP Jitter for processing, iCubeX and Wi-micro devices for input sensing, video tracking, audio analysis and event detection, improvised electronic instruments, and synchronized OSC timing via a network server. We were fortunate to have Tania Fraga bring her Java 3D virtual environments to the workshop, which created a beautiful lightscape when mixed in with the media. 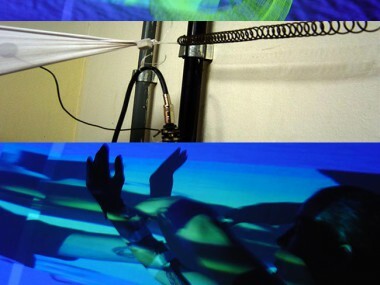 The dancer Ivani Santana performed live improvisation with the piece using a wireless control glove and other body sensors. On Saturday evening, I performed live video with Daevid Allen and Gong for the festival concert, which was a blast. Thanks to everyone who came out to the show for making the event such a wonderful time! Over the next few weeks, I will be posting some more pics and videos from the festival and the workshop. If you have any materials, let me know and I will be happy to post. IMPORTANT SAFETY INFORMATION: May cause you to fall asleep without any warning, even while doing normal daily activities such as driving. 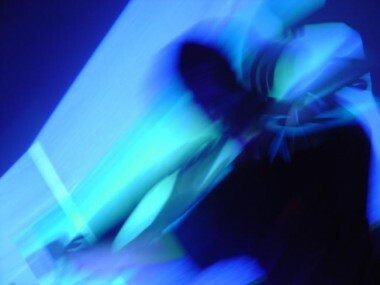 Hallucinations may occur and sometimes you may feel dizzy, sweaty or nauseated upon standing up. The most common side effects in clinical trials were nausea, headache, and tiredness. You should talk with your doctor if you experience these problems. Patients and caregivers should be informed that impulse control disorders/compulsive behaviors may occur. YouTube Doubler | Finally a way to watch two YouTube videos at once. Over in the tools dept., we’ve now got YouTube Doubler. Finally a way to watch two YouTube videos at once. 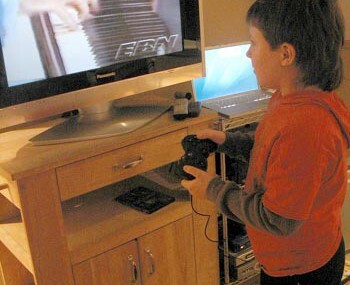 Baby Grand Master™ – The King of Video Instruments. Introducing the breathtaking Baby Grand Master™, Gardner Post’s latest, most muscled athlete. Shouldered and powerful as always, but sleeker now with Pioneer DVJ-X1 DVD players, this powerful entertainment machine is purposefully trimmed and tuned for heart-pounding performance. Artistic expression, power, control and comfort await notice with bold assurance. There’s not an ounce of excess. But there is anticipation… because on stage, in the museum, or in the living room, the Baby Grand Master™ commands. Now available to qualifying clientele. Sweatin’ to the old school: here are some early VuJak videos which I recently found on Hi-8 tapes in my closet. The first video is from the Digital Hollywood conference in Beverly Hills, 1994. Some friends at Interactive Light lent us an array of floor mounted infrared controllers, so we hooked them into VuJak and let people do what they wanted during the exhibit. Shown in this video is a dancer who got quicky hooked on it and spent a long time with it. Interactive Light, Inc. created the D Beam Controller, which is now integrated into Roland keyboards. The next video is just us having fun in the studio one night in 1993. We had just gotten the system working well and there were people over for a party, so we turned on the camera. Fun stuff. Busted out some of the old 3/4″ tapes from The Leisure Channel and digitized them for your viewing pleasure. These were produced for public access in New York and Los Angeles between 1987 and 1993. Some zany stuff – here are a few choice nuggets. In many ways much of what we were doing here has become “real” on the web, in particular the “All Talk” Show, which was just people talking and telling stories – not unlike what much of YouTube has become. And KTV – the 24 hour karoake channel. Seemed wacky then. Not any more. I’ve been playing with a game controller VJ interface for about a year, so I polished it up and used it live for this year’s Optronica show. Worked like a charm – fast, stable, and easy to use. I’ve shown this to a variety of people, and I think it’s a great interface. Addictive and fun. No learning curve. And I’ve been user testing it with kids to make sure it works right. This interface was made with Max/MSP/Jitter, and the hi object, and I’m running it on a MacBook Pro. It uses full res dv files and can scratch, jump, loop, and do real time effects. 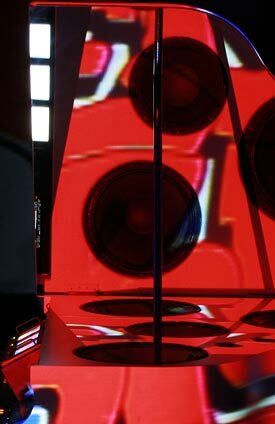 I have tried to build it to suit the real world needs of VJ’s. It also uses a standard usb game controller. The one I used for the show cost $10. 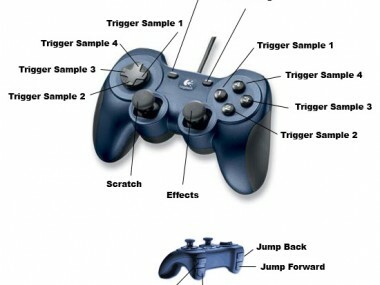 Below is an simple diagram of the button configuration. I went through a variety of configurations before deciding on this one. Magritte, a film by Mark Blank, performed by Calvin Thomas & The Special Touch with Mike Oatman. 1984. The first video sampler. 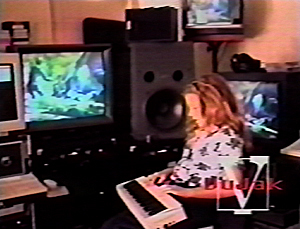 I created VuJak with Max (from Opcode at the time, now Max/MSP) with Lisa Eisenpresser and Jay Haynes. Much fun followed. I have many hours of video material which I will try and post in the next year or so. There are lots of good stories, too, so I will update this from time to time. I just posted a few videos here. There is a VuJak wikipedia page.